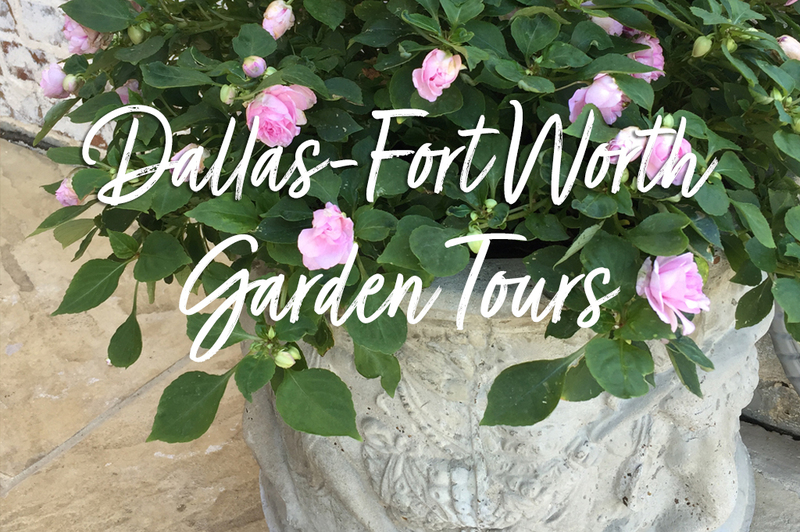 While attending the Collin County Master Gardeners Show this month I found the most wonderful vendor called Ozark Iris Gardens. Owned by two brothers who have turned their iris hobby into a business. 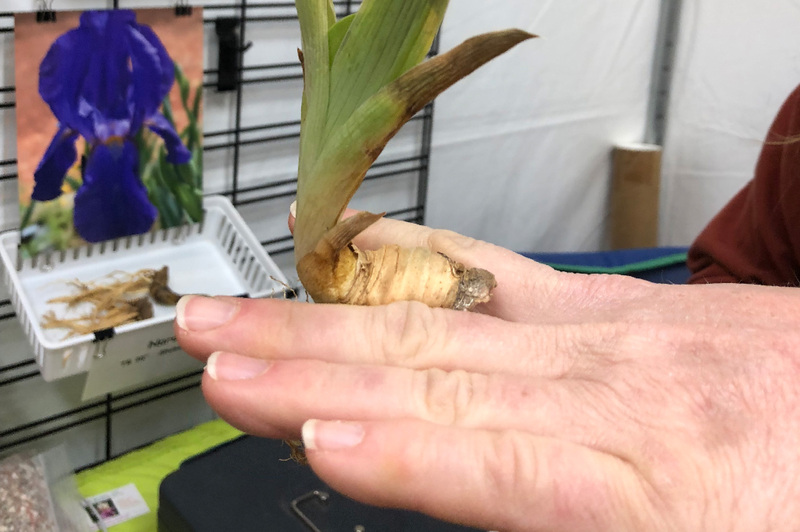 They grow and sell unique and rare irises from their Ozark, Arkansas farm. 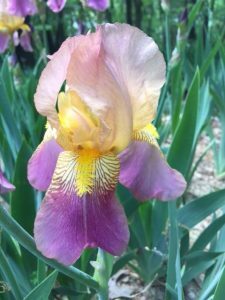 After purchasing several varieties from them, they provided me the most wonderful iris growing guide. Today I am sharing this guide with you all since the brothers were very kind in giving me permission to share their tips and tricks with you. 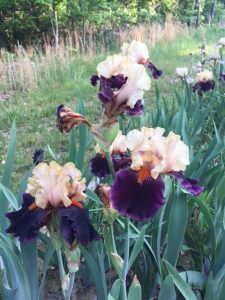 Honestly, I am still learning about irises myself, but I do have several varieties that I have collected from friends and family. 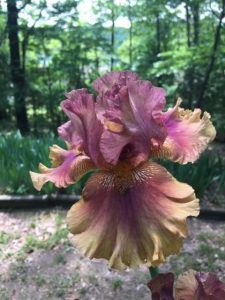 They are just such an easy plant to share and transplant and I am constantly hearing about people who have irises that have been passed down from previous generations. I also know that they are super hardy since we even have some planted by our mailbox which go pretty neglected for most of the year. Checkout this small sampling from Ozark Irises. Aren’t these just insanely gorgeous! Plant on a mound or raised bed in well drained soil. 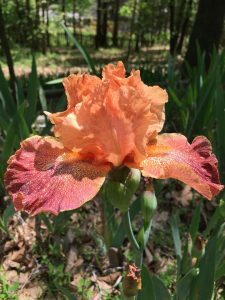 Most iris varieties do not like to be in moist conditions as rot can set in. Make sure the plant will get at least 6 hours of sun for the best blooms. An iris root is a called a rhizome and looks somewhat like a potato. A common mistake is to plant too deeply. For best growth and flowering conditions, plant the rhizome with the top fourth of the rhizome above the soil exposed to the sun. Check this great example below where the owner showed me how to plant the bulb. His hand is to represent the soil level on the bulb when planting. The owner of Ozark Iris Gardens shows me how far to plant the rhizomes by using his hand to represent the soil level. 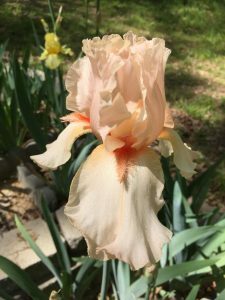 As irises grow, they grow outwardly to the side and the back of the plant, so don’t plant too close to the side or the back of a flower bed as it will soon crowd the borders as it grows. A good rule is 12 inches apart, but we like very full beds for the best show of blooms, so we often plant only 6 inches apart. Since the rhizome likes to be exposed to the sun, we do not use mulch. Mulch can also create moist conditions around the rhizome and not let enough air circulation around the plant, which can cause rotting. If the rhizome gets mushy, that is a condition called rot, which will kill the plant. If you must use mulch, try to keep it off the rhizome and away from the plant. 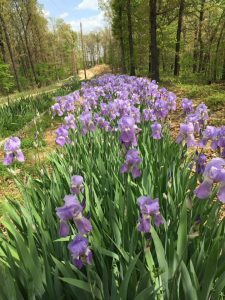 If there is no rain in the forecast, water the iris after planting. Irises don’t need a lot of water and usually the rain is enough. Be careful not to over water. It is best to plant in the late Summer to early Fall. If planted too close to winter, the plant could get frost heave where the plant comes out of the ground. This happens because the roots have not had time to become established before the freeze. 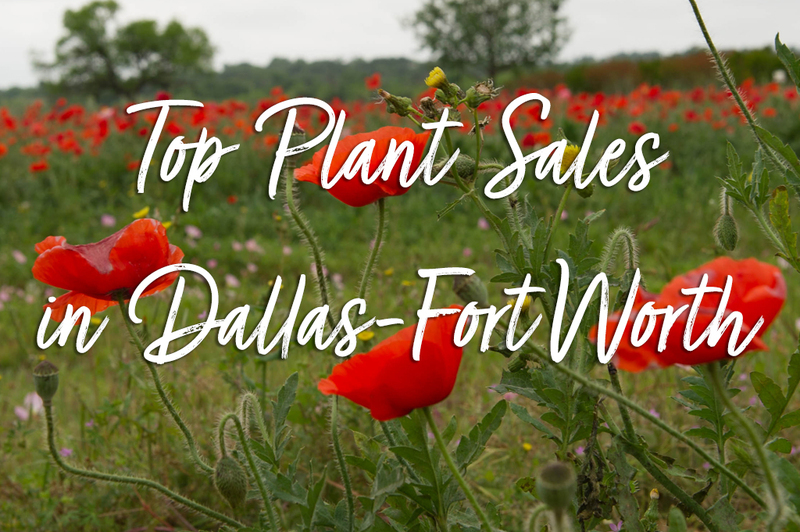 And lastly, don’t expect blooms in the first year of planting. Usually the second year is great for blooms and the third year is awesome. Irises do not like a lot of Nitrogen. Too much Nitrogen can lead to rot. Most fertilizer blends have too much Nitrogen. Ensure the Nitrogen in the blend is 6 or less. 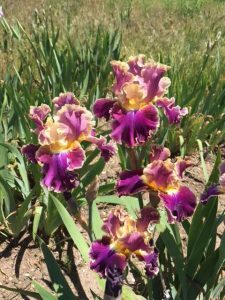 Irises do need a good dose of phosphate and potassium. 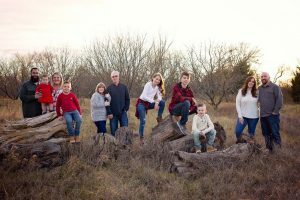 A good blend is 6-23-18. Fertilize twice a year, once before Spring and once in early Fall. 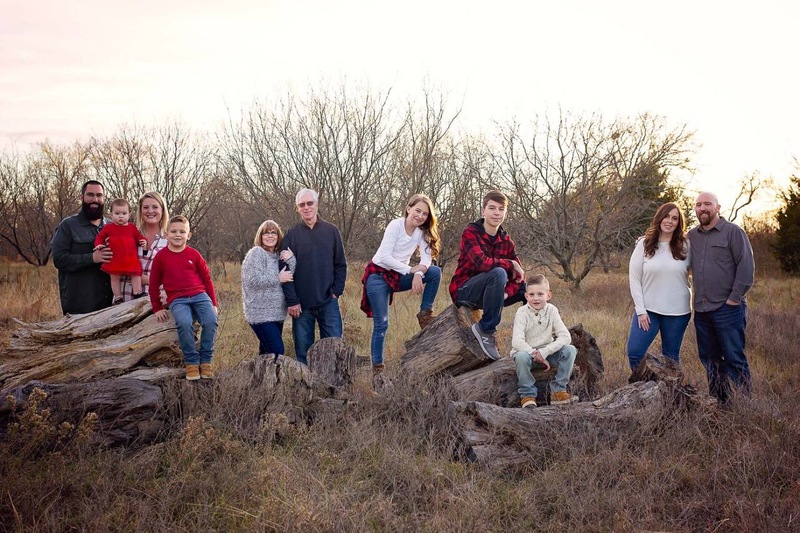 Checkout their special iris fertilizer on their website. 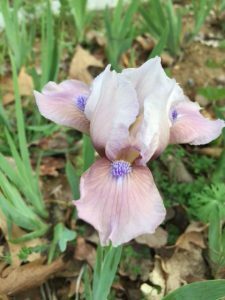 Irises do not need a lot of care. After bloom season is over, and if you are not hybridizing seeds, it is a good idea to cut off the bloom stalks close to the rhizomer for 2 reasons. First, as the bloom stalk dies back it begins to rot. If it doesn’t dry up completely, then the rot could get to the rhizome and cause some die out. 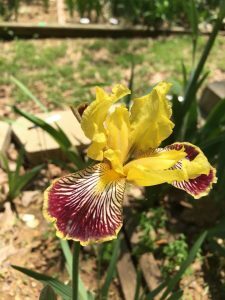 Second, and a most amazing thing about iris seed pods is that each seed in the pod can be a completely different flower, so if you want to maintain the same flower in your bed, do not let the seed pod grow and drop seeds in the bed. It is best to not cut off the iris leaves. The purpose of the leaves is for photosynthesis, so if the leaf is cut off, it is depriving the plant of nutrients. If the leaf turns brown or dries up, you can cut off the brown part or easily pull off the dried leaf. Some irises die completely back for the winter and the leaves turn brown and dry up. Just pull them off and new growth will appear in the Spring. Irises do like to be transplanted when they become overgrown. A good indication for the need to be transplanted is when the clump does not bloom well after a few good bloom seasons. For Tall Bearded Iris, this can be every 5-7 years and for smaller varieties it can be sooner. To transplant, dig up the clump. Some of the rhizomes will be long because a rhizome will grow a new length or nodule each year. Simply snap these apart and separate the clump into individual plants. You may end up with several extra rhizomes with no leaves on them. These are called mother rhizomes and are spent rhizomes that have already bloomed and had new growth in the past. These are usually thrown out. We like to seperate these from the plant and replant these, as we find that they will get new growth after being regenerated by the pruning. Trim the leaves before replanting. This helps the plants stand up until the roots can re-establish in the ground. 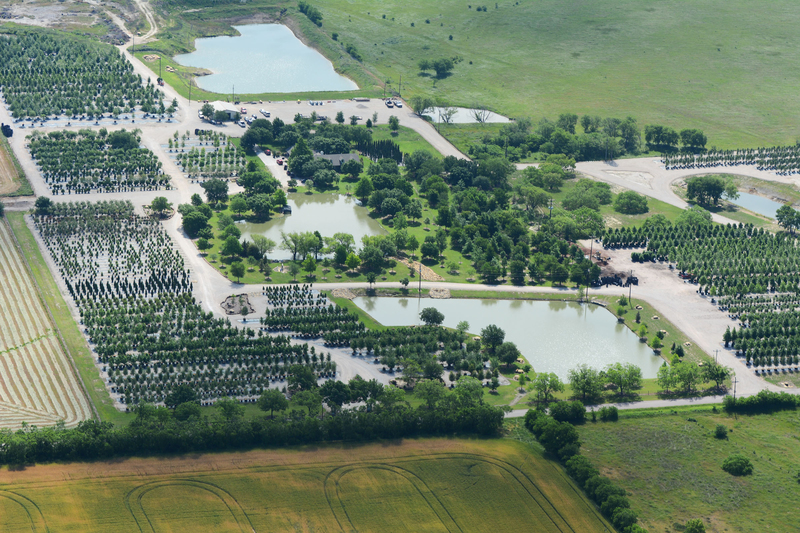 Here are some neat shots of Ozark Iris farm. I would be in heaven if I had that incredible field of irises. The deer do not like the taste of Iris leaves. An iris borer is a pest that comes from moth eggs. It will eat into the leaf and bore down to the rhizome. The infected leaves will rot and cause mush in the rhizome at the base of the leaf. This can be very destructive to an entire iris bed. Although we don’t like using pesticides, the best defense against borer caterpillars that have already hatched is a pesticide. Spray it on the leaves of the affected plant and those nearby. If you have a bad infestation, it is a good idea to burn the bed in late Winter (February) and clean out old leaves and get rid of any eggs. The burning does not kill the iris plant. The eggs are laid on the iris leaves, so a clean bed in the Fall where all the old leaves are cleared out is a natural defensive step. Crickets like to eat small holes in the rhizomes. This doesn’t typically kill the plant, but does do some damage to the rhizome, which leaves it more susceptible to diseases like rot. Plant the root an inch under the ground, covered completely, but not too deep. 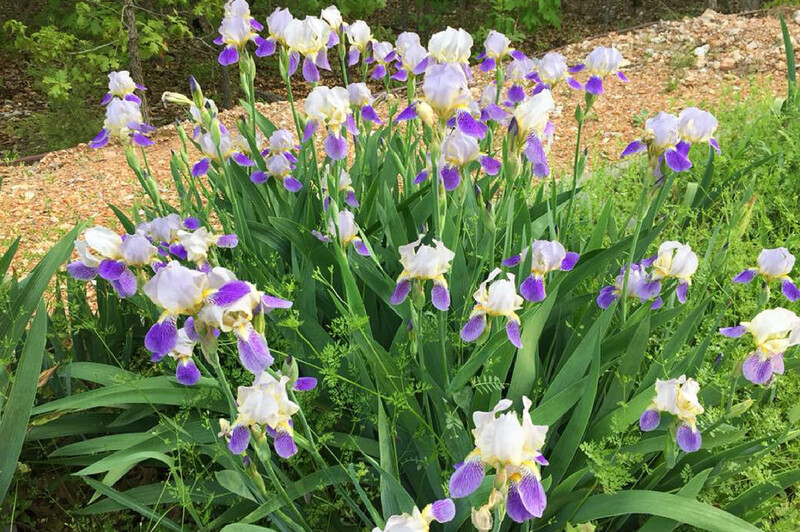 Louisiana Irises are more of a water plant and like to be near water, in ditches, and watered more frequently. Mulch as much as needed. Pine needles are great for mulching. I hope you have all found these tips helpful. I am so thankful that the guys at Ozark Irises allowed me to share all of their hard earned secrets. I would also love to see what everyone has growing in their gardens. Feel free to send in pictures of your irises.